Gain a clear understanding of Google's Keyword Ranking process. Learn how and why Google chose to rank our article on the first page for our target keyword so you can better analyze your own content marketing. It’s why we spend so much time creating search engine optimized content in the first place. But what does Google keyword ranking even look like? Today we’re following the story of a recent Uhuru article on its way to Google’s first page. Google didn’t just take a look at our massive Guide to Facebook Retargeting and decide it belonged on the first page. Instead, it tested our content to see how its users responded. It analyzed users’ behavior when they were exposed to the guide in their search results, and paid close attention to what they did when they actually clicked through to read it. The path an article takes from first published to the first page is an intricate and important piece of the ranking puzzle, so follow along as we explain exactly how our guide made the transition from existing in the ethers of the internet to its current position on Google’s first page. When we use the words “Google Keyword Ranking,” we’re talking about the process of Google deciding our content is relevant to its users’ search queries, as well as the subsequent jostling for top position while competing with similar content. Once an article is indexed, it’s up to Google to decide just how much value the article provides to searches. If by the grace of the Google Gods, your content is deemed worthy, you’ll find your article on their first page. First-page ranking means clicks, traffic, leads, and sales, which is why we all work so hard to create highly optimized content. But what exactly is Google looking for? There are tons of ranking factors that Google uses to evaluate your content. While listing them all would go way beyond the scope of this post, let’s look at a few of the important ones. This should come as no surprise. In order to deliver the ultimate user experience, Google needs to put the best content in front of searchers to help them answer questions and solve problems. In fact, the importance of content seems to keep growing as Google gets smarter. Search results are being generated largely by the value of naturally written, easy-to-understand posts, while the emphasis on keywords is slowly diminishing. The guide we published was easily the most comprehensive of its kind. It provided readers with an expert-level understanding of how to use Facebook’s Pixel to retarget website visitors. 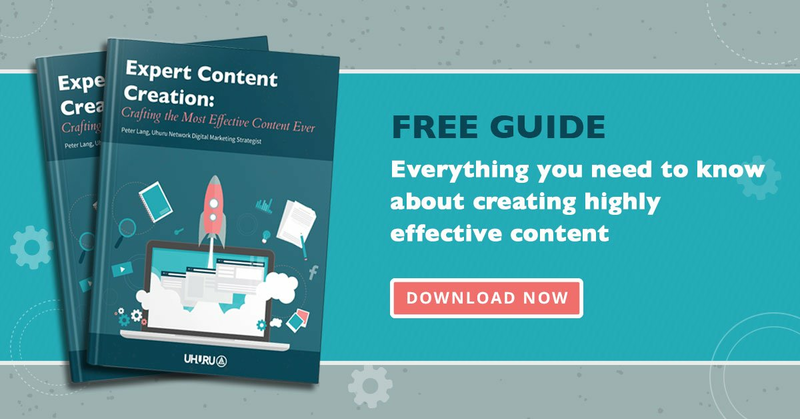 This 50+ page guide was nearly 10k words and was an obvious choice for Google’s first page. Yes, we all know backlinks are important. One of the reasons they’re so important is that Google uses them as a signal to identify pages that other people find exceptionally valuable. After all, nobody is going to link to a page to help make their case or expand on a topic if that content is sub-par. Remember, Google is getting smarter. It’s become much better at discerning the good (organic, relevant, high authority) links from the bad (spammy, low authority, blackhat). While the guide had yet to earn any direct backlinks, the fact that UhuruNetwork.com has earned over 3,600 (high-quality and relevant) backlinks has helped to establish our website as an authority in our industry, which helps Google better understand our content and trust in its quality. This is yet another reason our content was destined for the first page. With our society becoming more mobile-centric by the day, it’s no wonder Google is placing such an emphasis on mobile-friendly websites. Remember, Google serves its users, so a fast-loading, easy-to-navigate mobile experience will earn you some serious points. Be sure to read our recent article for more on mobile marketing. At Uhuru, we work hard to make sure everything we publish is optimized to deliver the best possible mobile user experience. This even goes for massive guides like the one we’re discussing in this article. As we mentioned, Google prioritizes mobile-friendly content, which means mobile optimization gave this guide a head start to its first-page placement. We could write several thousand words about the other ranking factors that need to be evaluated when optimizing your content, but that’s not why we’re here today. Be sure not to miss our recent article for more on what to expect from your content when trying to rank on Google. Let’s look at the tool we’ll use to track our guide on its journey to Google’s first page. One of the tools we use to track our guide’s Google keyword ranking is easy to use and free to all—Google Search Console. If you’re not already familiar with this powerful tool, it’s important that you start using it to understand how Google treats your pages and how interactions with your content can alter its course to first page rankings. To better understand how and why Search Console is important, read Google’s own article. For the purpose of this article, we’ll be tracking the performance of one of our secondary keywords—Facebook Retargeting. Our primary keyword ranked unusually fast and doesn’t tell the story of a more typical time to rank and the ranking process. Because we’re tracking using Google’s own Search Console, we aren’t tracking keywords. We’re tracking the actual query Google received from its users. The information below is based on the searches that actually typed in the words Facebook Retargeting. Now that you know how we set up our guide for ranking success and the tool we used to track its ranking, let’s look at how it performed from first publishing to reaching the first page of the world’s largest search engine. On January 22, 2017, we clicked the publish button (on our WP-hosted website) and our Definitive Guide to Facebook Retargeting was live for the world to see. The following day the article was sent out to our mailing list at 10 a.m. (the recipient’s local time). We’ll be using the words “appeared” and “disappeared” to describe when Google tested placing our guide in any position worth mentioning or when it stashed it back into the ethers where new or invaluable content hides. To be clear, it never actually goes anywhere. Effectively it is still “ranking” in a particular position at any point in time after Google indexes the page. How Long Does It Take to Rank on Google’s First Page? Technically speaking, it doesn’t take long. Google tests the performance of new content by exposing it to searchers to gather feedback. Our guide was on the first page only 8 days after we published it. It was exposed to a whopping 1 person and because they didn’t engage with it, Google stripped us from its first pages. The guide disappeared from the top rankings for 10 days, but Google tested it again on February 9th. We got stuck in position 8 once again, received 3 impressions, but generated zero clicks. This is entirely understandable as the vast majority of clicks are distributed between the top 3 positions. The following day we ended up in position 14. The thinking is that if a searcher is willing to get to the second page, they may be less apt to simply opt for one of the first three results. However, we still didn’t generate a click. The Definitive Guide to Facebook Retargeting disappeared for another 11 days. Google’s algorithm must have decided it was time to try us out in one of those prime spots to see if we could generate a click. Unfortunately, we didn’t receive the ever powerful ranking signal during our limited run in positions 2, 3, and 4. We disappeared for another 17 days before Google place back on the second page (pos. 18.5). Still not enough to drive any engagement. Fifth Appearance – A Click! After we disappeared for another 6 days, things started to get interesting. We found our content in position 4, received 1 impression, and generated the almighty click! We ended up in position 20, with 1 impression, 0 clicks. We disappeared for a few days before we were back in position 5 producing similar results. Five more days in the ether, then position 18, 1 impression, no clicks. By the time March 28th came along, Google understood our content was valuable. At this point, it was ready to hold us at a consistent position on the first two pages. Our Google keyword ranking wasn’t where we wanted it to be yet, but we had earned some valuable attention. March 31 – Position 6, 7 impressions, 1 CLICK! April 3 – Position 4.7, 3 impressions, 1 CLICK! April 5 – Position 2.6, 10 impressions, 1 CLICK! At this point, Google had seen that its users are interested in what our guide had to offer. Better yet, it had seen that the time the people that clicked through spent with our content was longer than average. That meant that when people got to our guide they were presented with the information they needed to help solve their problem or answer their question. And that is Google’s number one priority after all; to provide the best result given the query. We Saw Consistent First Page Placement After Over 2 Months! The coming week saw continual improvement in placement and performance. Just because our content was on the first page didn’t guarantee it would stay there. Google is always testing the performance of your content to determine whether it is the most relevant result to display to its users. We generated positive averages, which helped solidify our placement at the top of the rankings. As of April 5, 2019, we currently maintain a position in the top 1-5 results on the first page. It changes every few weeks. We also rank for 105 additional keywords thanks to this massive article and this will increase. While they certainly aren’t all on the first page today, many continue to slowly climb toward a click-worthy position. Many people are confused by the Google keyword ranking process and how Google decides where your content belongs. Hopefully, this has helped you to clearly understand how Google chooses its top search results, as well as the importance of the construction of content worthy of a first-page placement. Ready for more? Don’t miss this detailed article on How Search Engines Work.